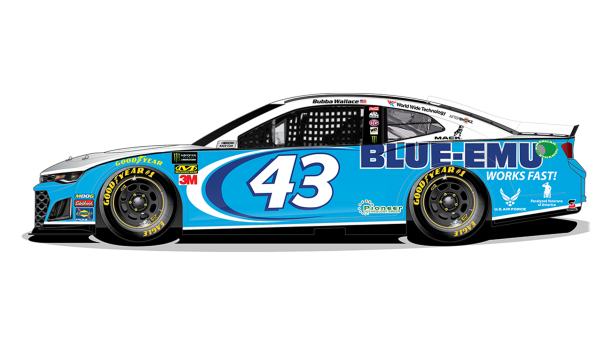 WELCOME, N.C. (April 3, 2019)—Richard Petty Motorsports (RPM) announced today the renewed partnership with Blue-Emu. As part of the agreement, the No. 43 Chevrolet Camaro ZL1 will carry the Blue-Emu brand as the primary partner in the Monster Energy NASCAR Cup Series (MENCS) Food City 500 at the Bristol (Tenn.) Motor Speedway on Sunday, April 7 with driver Darrell “Bubba” Wallace Jr.
Blue-Emu will return to battle with RPM at the iconic all-concrete half-mile. Nestled between the rolling hills and mountains of Northeast Tennessee, Bristol Motor Speedway is the home track for the Bristol, Tenn.,-based company. This weekend marks the second primary partnership with RPM at The Last Great Colosseum, and the first with Wallace. Blue-Emu is no stranger to the organization, being an associate sponsor of RPM during the 2014 season, and with a primary partnership the following year at the Bristol Motor Speedway as well as at the Sonoma Raceway in 2016. Nutrition & Fitness, Inc. (dba / NFI Consumer Products) is an innovative consumer products company that manufactures, markets, and distributes the Blue-Emu line of products for muscle, joint and skin conditions. This weekend, Blue-Emu, America’s number-one emu oil brand, heads to the Bristol Motor Speedway with Wallace, for a race at the short track that guarantees beating, banging, and temper tantrums. The driver of the No. 43 Blue-Emu Chevrolet Camaro ZL1 for RPM has two starts in the Monster Energy NASCAR Cup Series at the .533-mile high-banked bullring. Wallace posted a career-best finish at the Bristol Motor Speedway of 16th-place on April 16, 2018, and led his first laps in the series. The Mobile, Ala.,-native has also notched a top-10 finish in five career starts at Northeast Tennessee’s “Thunder Valley” in the NASCAR Xfinity Series (NXS). After coming so close to winning in NASCAR Gander Outdoors Truck Series (NGOTS) at the track with a second-place finish in 2014, Wallace would like nothing more than to bring home a Gladiator Sword – the trophy given to conquerors of the Bristol Motor Speedway. A performance and marketing driven company, Richard Petty Motorsports (RPM), co-owned by NASCAR Hall of Famer Richard Petty and successful business entrepreneur Andrew Murstein, is one of the most recognized brands in all of motorsports. RPM is the winningest team in NASCAR Cup history with 273 wins and has business partnerships with national and global leaders. Today the race operation fields the famed No. 43 in the Monster Energy NASCAR Cup Series with driver Bubba Wallace. The team is headquartered in Welcome, N.C. and is supported by primary partners United States Air Force and World Wide Technology.